Autumn is the season of harvest. The 8th International Trade Fair for Laboratory Technology, Analysis, Biotechnology and Diagnostics (2016 Analytical China) kicked off at the Shanghai New International Expo Center on October 10th, 2016. 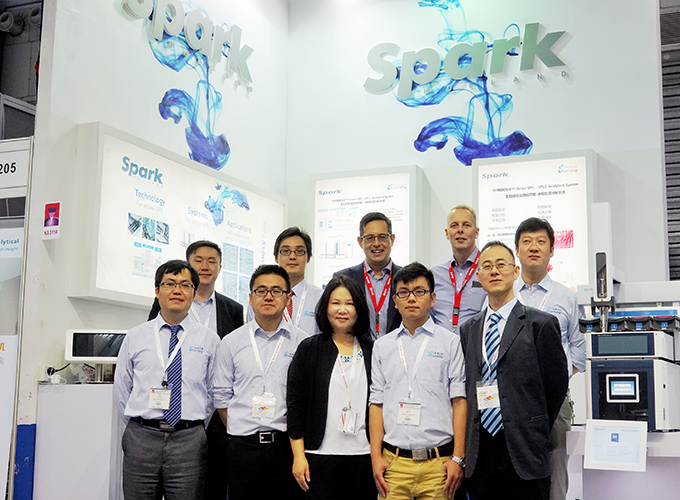 Esensing and Spark exhibited the latest products and efficient solutions, aimed to provide the most advanced technology and efficient solutions to more customers. A series of flagship products including Spark Online SPE-LC system, DEENA Automated Sample Digestion System, MERX Mercury Analyzer, Electrolab Dissolution Tester and QuEChERS Platform—AutoMate-Q40 were displayed by Esensing. The AutoMate-Q40 is a revolutionary system specifically designed and optimized to automate the QuEChERS sample preparation workflow. The system can optimize QuEChERS sample preparation methods and parameters. Since its first presented on the 3rd Huan Bo hai Seminar on Chromatographic Science and Mass Spectrometry, AutoMateTM-Q40 has attracted a lot of interests from domestic customer. During Analytical China, it had be surrounded by audiences that watching the movements of automation. At the booth, Esensing highlighted the performance and the advantages of all the products through a variety of programs that included on-site demonstrations, brochure introductions and interactive activities. This allowed customers to test or practice with the equiqment first hand, which won a wide attention from the participants.